These exams can now be scheduled and taken at any participating PearsonVue testing center. They will also be offered in the onsite Certification Exam Center at VMworld 2016 (US and Europe) for 50% off. Next exam that will be released should be the desing on the EUC path (the beta has started one month later compare to the previous exams). But, in my opinion, some must be improved, considering that the announce of vSphere 6.0 was done on Feb, 2nd 2015! 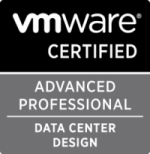 You cannot wait more than one year to have those kind of exams that are mandatory for the VCDX certification upgrade, but also really useful to upgrade your VCP status (I had to take the VCP6-DCV exam because was close to the expiration date).